Butterkuchen means 'Butter Cake' in German. It's part of a family of sheet cakes (called Blechkuchen) that are often made with yeasted dough. This is one of the simplest. More poignantly, Butterkuchen is also called Freud-und-Leid-Kuchen or 'Joy and Sorrow Cake' because it is often served at weddings and funerals in North Germany. I think the name shows beautifully how entwined food is with our celebrations, our emotions and our lives. When I decided to make a Butterkuchen I wasn't sure where to start. If I'm looking at making a recipe where I either have no idea who to trust or there are so many authoritative recipes that I don't know where to begin, I turn to a method I developed a few years ago for choux pastry. First, I found six recipes, three in English and three in German: One, Two, Three, Four, Five, Six. I then typed each ingredient into a spreadsheet, making conversions and translations as I went. From there I divided each ingredient weight by the flour weight in each recipe (i.e., for no.1 below, sugar was 30/250 = 0.12) so that I had a ratio (I sometimes use eggs as the starting point too). This means I can directly compare the proportions in each recipe. Instead of working out the average proportion for each ingredient I tend to have a look and decide on a sensible value, taking into account my general preferences and outliers. For instance, with the sugar for the dough, I chose 0.1 after looking at 0.12, 0.28, 0.11, 0.12, 0.12 and 0.1, as I tend to err on the side of less sugar and 0.28 seemed out of line. I then decided on a size for the recipe based on the ingredient I started with (i.e. flour). For this one I chose to make a small sheet, as it's much better when it's fresh and warm from the oven, so I went for 250g of flour. I then multiplied up the remaining ingredients (i.e, for the sugar, 0.1 x 250 = 25g). Finally, I work out a method from comparing the recipes and my experience with similar recipes. I then adjust the ingredients and method if needed as I test. This one worked perfectly the first time, so I just tested it twice again to check it was consistent. A few of the recipes I found included cinnamon in the topping but I decided to focus on the butter, almonds and vanilla. Vanilla is often included in the recipes as vanilla sugar sachets but I was in a luxurious mood and decided to rub the seeds from half a vanilla bean into the sugar for the topping. I think it's worth it - the flavour and smell is wonderful and the flecks look very pretty in the sugar crust. This is a really enjoyable recipe to make. There's something incredibly satisfying about poking the holes in the soft dough and then filling all of the dents with the little chunks of butter. It's also absolutely delicious - buttery, crisp, crunchy, nutty and almost like a doughnut. Put the milk and butter into a small pan and heat until the butter has melted and the milk is steaming. Pour into a bowl (preferably metal) and place in the fridge or freezer to cool. Once the milk has cooled to warm, whisk the flour, sugar and salt together in the bowl of a stand mixer. Sprinkle in the yeast and whisk in. Lightly beat the egg then add it and the milk to the bowl. Stir until the dough comes together. Attach the dough hook and knead for 4 minutes - by the end, the dough should be smooth and elastic. It's very sticky at this point but don't worry. Cover with cling film or a clean tea towel and leave to rise in a warm, draft-free place until the dough has doubled (about 45-60 minutes). Dust a work surface with flour then tip the dough out onto it. Dust the top with flour then roll out to an even rectangle of about 28 x 20cm (11 x 8"). Transfer to a greased, rimmed baking sheet. Cover with a clean tea towel and leave to rise for about 20-30 minutes - it won't rise a huge amount, but when it's ready a poke should leave a clear indent. Preheat the oven to 200C/390F. Weigh out the sugar into a small bowl. Split the vanilla pod and scrape the seeds into the bowl. Rub the seeds into the sugar until they're evenly distributed. Cut the butter up into tiny cubes. When the dough is ready use a finger to poke lots of dents in the dough (pushing down to the bottom but not making a hole - see picture above) - you may need to dip your finger in the sugar if it starts sticking to the dough. Place a small cube of butter in each of the dents. Sprinkle the dough evenly with the vanilla sugar, then the almonds. Bake for about 17-20 minutes, turning at 10 minutes, until the dough has risen, bronzed and the almonds are golden-brown all over and caramelising. There might be butter in the tray - don't worry. Once it has cooled a little, you should be able to tap it and get a hollow sound. Leave to cool until warm, then slice up. Best eaten while still warm or very fresh. You can freeze it and reheat it but it's not quite the same. *You could use vanilla sugar instead, though I love the way the seeds look and the amount of flavour they give. You can make a batch of vanilla sugar from the scraped pod when you make this and use it next time (or for something else, of course). If you don't have vanilla sugar or a pod, you could add 1 tsp of vanilla paste, or failing that, extract, to the dough, though it won't have the same effect. Holy that must have been time consuming filling each and every indentation with butter! But the outcome looks amazing! This looks delicious Emma. I love how much I learn from your posts. Great work! I'm glad that someone else uses the same method of recipe creation as I like - you can't go wrong with a spreadsheet! Love the butteriness of this cake and I'm very drawn to your description of it as almost like a doughnut! Butterkuchen! I grew up eating this - it is the typical cake you can buy in most bakeries back home and that people bring to large gatherings. I did not know it is typically eaten at weddings or funerals but it does not surprise me. However simple its name, it is such a perfect description because the cake is so unbelievably buttery - reading your post brought back incredibly vivid memories of biting into a slice of this, the crunch from the sugar on top and the flaky almonds. I loved the little insight into your recipe creation process as well - I tend to do the exact same thing and however precise I start out end up making some executive decisions based on what feels right, experience etc and ignoring the outlyers if there is no good reason to include them. What a gorgeous looking cake. I like that it's not lots of different flavours competing with each other. Very impressed by your spreadsheet as well! I have a similar way of working out new recipes, except mine involves awful bits of scrappy paper, illogical sums and wonky grids...this is so much more organised and mathematical and something I really need to try with my baking :-) As for the result, this cake looks SO yummy, love the topping and the thought of those studs of creamy butter - so good. Oh my goodness - this is so scientific. And so far from my own 'I'll add a little bit more of this and little bit more of that and see how it comes out' method. I am very, very impressed. The cake looks sublime. Perfect for elevenses. I loved it! I have heard of Bienenstich a few times (not to mention when Smitten Kitchen posted about it) - it looks lovely. I really enjoy trying things from other countries, there's so much to explore. It's not too bad really - and it's very satisfying! Also totally worth it. I'm glad you like it - it really is delicious. I'm very impressed by your spreadsheet method! What a good idea! I shall try it! I love the intricacy of your recipe preparation. It's definitely given me something to think about next time I work on a recipe. 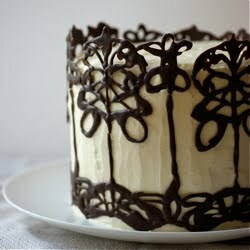 This cake looks gorgeous too. I wonder if this is related at all to the St. Louis classic--Gooey Butter Cake. I know St. Louis has deep German roots. I don't believe it's yeasted, resembling more of a plain yellow cake but very, very rich. This looks like a much tastier, less sweet version, though. I can't wait to find an excuse to make this! I think the dry yeast should be mixed into the milk and butter, same as the fresh. Otherwise I found my yeast didn't dissolve enough for any rise. Any advice? Just wanted to say that you're a genius! I'm definitely going to use your system in the future. It can be a real hassle trying to figure out what recipe to try when you're craving something new and exotic! By the way, love your blog! And these look great! Do they really taste like doughnuts? By the way, I'm so glad I finally figured out how to use Disqus! I've been meaning to leave you a comment ever since I read about the Almost-Linzer Torte! Hi Nadia - I always stir fast action dried yeast straight into the dry ingredients and haven't had any problems before - the granules are so small. Did the milk mixture cool down properly before you added it? The heat can kill the yeast. I think I'd probably use this recipe for the dough now: http://www.poiresauchocolat.net/2012/03/chelsea-buns.html . Hope that helps. I'm so pleased you have - do you mind me asking what you found confusing about it? It's a fun system - I think it's good to have a think about proportions anyway, and it makes scaling things really easy. They taste like doughnuts in that they're yeasty and sugary and the butter melts all over the dough and so they sort of fry as they bake. So not exactly, but they do remind me of them! Thank you Tina - what a lovely comment. Ahh, spreadsheets! Doughnuts are very alluring things. This cake does basically fry itself in butter. I'm so pleased that you liked it, especially as you grew up with it! It's always a bit nervewracking looking at something from another culture, though I do love doing it. Good to know that you use a similar technique! It's a great way of doing things. Though I don't do it for every recipe - only when I'm not sure where to start or it's a classic. I do love the simplicity of the flavours - it really doesn't need anything else. I'm a very bit-of-that-and-this when I'm cooking - baking is a bit different, though I'm not always this precise! Glad you like the cake. It is a bit yum :) Glad you like it. Ahh recipe testing nerdiness... the best way to be. It's a good way to work things out if you're not sure where to start. Do let me know if you try it! I'm glad you like it. It's not always quite this detailed - there's a lot of scribbling in my notebooks too - but it is a great method for some recipes. How interesting, I hadn't thought of that. I did make some gooey butter cake a few years ago and it was very rich. I hope you do try it - let me know what you think if you do. I guess I found it a bit confusing because I had never seen or used it before. I don't have Facebook or Twitter either, so I couldn't sign in any other way ;) It had to be Disqus. Ah ok, that makes sense. I just don't want it to be confusing! Wow this spreadsheet is great, you go girl! I think this is like my approach to baking, except I do this on paper and it takes a few days before I get in the kitchen and start making something I've been planning. But of course, you are a blogger after all :) I am so happy I found your site; I will be roaming here a lot. Heh! I always write my recipes out in my notebook, so there's paper involved too :) I'm so pleased you like the site. Awesome post and I love your blog! I'm an American who moved to Germany to become an apprentice pastry chef... and I must say, well done! I love Butterkuchen! There's so many possibilities with this cake! I'm glad you like it! Butterkuchen is great. This butterkuchen reminds me of my mom Anneliese, she used to bake it each week end, it will last one day before it's gone.